These are some example checklists to illustrate the kind of testing that can be performed with Testpad. Import them into your own account by copying their raw text from github into the Edit->Import dialog. One of the many scripts used to test Testpad. Exploratory in style but listing the main behaviours ensures they are visited during testing. One of the scripts used to test the mobile interface for running tests on Testpad. Illustrates how terse test descriptions can be and yet still be useful; obviously assumes the tester has familiarity with product. Testpad is designed for free-form test descriptions and does not provide rigid field structures. However, where more traditional test cases are desired, simple conventions can be applied. This example script serves to illustrate some of the possibilities for how teams might organise more traditional test cases. Simple template illustrating how exploratory testing could be organised. Here features are simply listed in groups. Recording a 'pass' would mean 'no problems found'. Template illustrating how Testpad might be used to plan tests from sprint to sprint as user stories are produced, modified and removed. Descriptions could be copy and pasted verbatim from other documentation, or transcribed into more 'test' sounding statements. Complete checklist for submitting an iPhone/iPad app to the App Store. 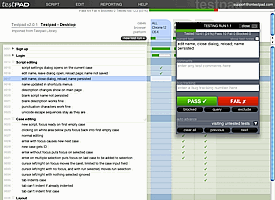 An example of the checklist-style of software testing you can do with Testpad. Originally published in 2012. FULLY UPDATED FOR 2018. A template to use for the general testing of an iOS app. Not everything will be relevant to all apps, so import and customise before use. A general purpose checklist for launching a website. For websites with user accounts, see the separate checklist on security. A checklist of security considerations for a website with sessions and user accounts. For much more detail, please see the info and cheat sheets at https://www.owasp.org/. A business/software planning checklist to help scope the design and work involved in integrating an online payments solution for a subscription-based service.